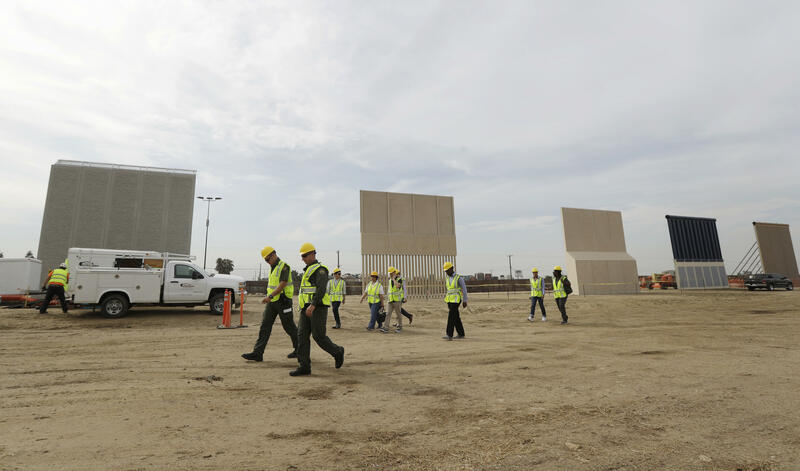 Rallies for and against Donald Trump's "big beautiful border wall" with Mexico are expected to mark his first visit to California as president amid growing tensions between his administration and the state over immigration enforcement. Trump will visit eight towering prototypes of his planned wall Tuesday before addressing Marines in San Diego and attending a fund-raiser in Los Angeles. A top federal immigration official lashed out at some of the state's elected leaders ahead of the visit. Thomas Homan, U.S. Immigration and Customs Enforcement's acting director, singled out Gov. Jerry Brown, U.S. Sen. Dianne Feinstein and House Minority Leader Nancy Pelosi on Monday for recent criticism of a spate of immigration arrests in the state and a federal lawsuit challenging state laws that limit cooperation on immigration. Homan said Pelosi's comments about federal agents terrorizing immigrant communities were "beyond the pale" and challenged Feinstein to change laws if she disagreed with how they are enforced. Protests are also being planned across the border in Tijuana, Mexico, when Trump will examine the 30-foot-tall prototypes built along the international border to fulfill his signature campaign promise. Trump has insisted Mexico pay for the wall but Mexico has adamantly refused to consider the idea. Numerous rallies both for-and-against Donald Trump's "big beautiful border wall" are expected to mark his first visit to California as president on Tuesday. About 250 people protested Trump in San Diego on Monday.